Pausing is taking time to reflect, noticing what we are doing and/or feeling and allowing ourselves to be fully present. 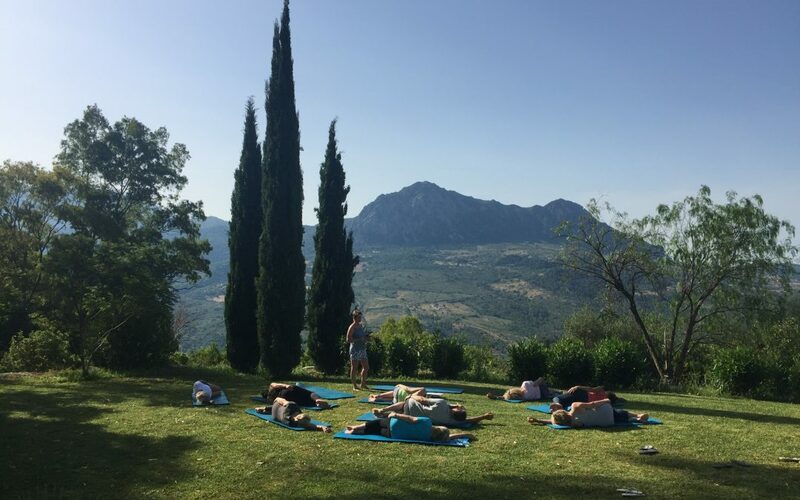 A month ago, in June along with my sister, and brother-in law we ran our first Mindfulness and Pilates holiday in Andalucía. Ten participants joined us for a week away from our daily working lives. It was a great success. For a week, our participants were able to immerse themselves fully in strengthening their bodies, calming the mind and relaxing. They were undisturbed and taken care of. The challenge however, comes when we return home from holidays like this. How do we stop ourselves getting caught up in the hurly burly of the everyday? It is POSSIBLE to find peace and quiet in the small moments in our busy lives. But….…. How can we pause when we have so much to do? Many people assume that to meditate or practise mindfulness we have to be physically still. This is not true. Even the simple act of washing our hands, making a cup of tea can be meditative and mindful. What we are ‘pausing’ is the chattering mind. Consider that we humans have around fifty thousand separate thoughts each day, many of these thoughts are concerned with the fears and pressures of everyday life. Who will look after my children when they are poorly? What if I never find a partner? Pausing is an opportunity to quiet the chattering mind. Now take a deep breath and exhale slowly. That probably took 15 seconds – but during that time your attention was on your body not on your thoughts. We are unconsciously expert at many every day activities. For example, we do not stand before the mirror, toothbrush in hand, saying ‘I wonder where the instructions are for this?’ Nor if we are physically well, do we scratch our heads when we wake up and wonder how to get out of bed. Because we can do these things with ease, they make good activities for calming the mind, especially when using the FIVE senses. After you have made your cup of tea, smell it, does it have a smell? Be aware of the desire to DO something while the kettle is boiling – whether it be to pop to the toilet, wash up some cups, check your phone. Do these things either before or after – but while the kettle boils, stand, quietly – take this minute or two to pause. Notice also the JUDGEMENTAL mind. Instead of taking in the colour, shape, and texture of the cup, you may be thinking, “this cup has a stain on it, I wish people washed the cups up properly here”. Now you are no longer noting colour, you are judging it. Next time you have a break from your desk count how many steps you take to and from your destination. Counting will encourage you to focus on your feet and also allows us a rest from the work back at the desk. The danger of not pausing or reflecting is all too evident. How many times have you found yourself saying what happened to that year?! Where has the time gone!? We are all mortals and our lives are precious. Therefore, if we don’t give ourselves time to slow down, and reflect then we are in danger of never fully living our lives. Push the boat out and join us for our next Mindfulness and Pilates holiday in Andulusia! Thanks Emma for this timely reminder on how to be more mindful everyday. I feel calmer already. Great – i never know if what I’m writing makes any difference to people, so it’s lovely to have a comment like yours, thank you.